PRODUCT DESCRIPTION: Odorless material which is both easy to apply and effective on a wide range of pests. 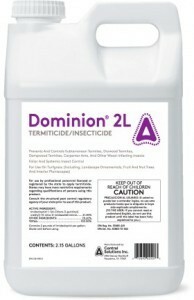 Generally used as a termiticide, this material is highly effective as a systemic for use on trees and shrubs in the yard. WHERE TO USE IT: Inside the home subslab and outside the home for soil treating. Also around trees as a systemic. RATE OF APPLICATION: When soil drenching shrubs and trees, use .1 – .2 oz per inch of tree diameter. So for a tree 10 inches wide, you'll need to use 1 oz of chemical using 6-8 gallons of water. Start by adding .5 oz to a 5 gallon pail filled with 3-4 gallons of water and slowly pour the solution into 5-10 holes made with a spike, a piece of rebar or pick ax. The holes need to be made inside the tree's drip line and you'll need to do this at least twice meaning you'll need to apply 6-8 gallons of mixed solution using a total of 1 oz of Dominion. The depth of the holes are not important; they just need to hold the liquid mixture so it doesn't move away from the tree. Also, the width is not important. Again, the holes are just there to hold the mixture. Larger trees will require more material; call or email for help if you need assistance calculating how much product you'll need. For termites, mix 1 oz in 2 gallons of water and apply the 2 gallons of mixed solution to every 10 feet of foundation around the structure. Dig a small trench prior to treating to insure the material stays in place during the application. Retreat every 5 years. TARGET PESTS: Termites, Adelgids, Ants, Aphids, Japanese beetles, Lace bugs, Leaf beetles (including elm and viburnum leaf beetles), Leafhoppers (including glassy- winged sharpshooter), Mealybugs, Psyllids, Sawfly Larvae, Thrips (suppression), Whiteflies and Woolly Adelgids just to name just a few. I have several large pine trees on my property. Some already are showing damage for pine beetles. I would like to treat all of my trees at the same time. 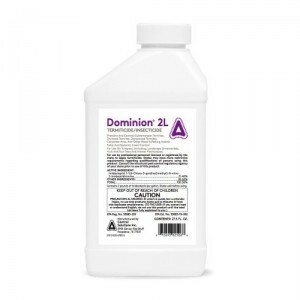 How do I determine how much DOMINION 2L to purchase? If you review the specimen label (link to the label is above) you can read up on all the details of how to make this calculation. Basically you'll need .1 to .2 oz per inch of tree width. So if the trunk of the pine is 10 inches, you'll need to apply 1-2 oz to that tree as detailed above using the soil drenching method (which is very easy to do). On a side note, treating more trees than what is currently showing as having an active problem is always the smart play. This way you'll be reducing the chances of the problem spreading. As a systemic application, will this treat most bark beetles? Yes and no. There are many different species of what we call "bark beetles". Some species will barely enter the bark to feed; others will target the cambium, sapwood or heartwood layer. Since the amount of systemic penetration will vary from tree to tree, its hard to say with any certainty that you'll get complete protection unless you knew the penetration for that particular tree and how deep the invading beetle will go to feed. With that being said, we know there are some beetle species that don't bore nearly deep enough so to insure protection all species, trees you want to protect should be treated both systemically and topically. So don't just rely on the systemic action. Do drench the soil but also surface spray. Since systemic benefit will take months to establish itself, surface treating is always recommended anyway and will help provide quicker results as well as target populations trying to live on the outer most section of the trunk. You guys are awesome with such a quick response. I do know the beetle I have is boring in the lower 8' of the tree and I have about 15 spots where you can see the 'ooze'. 13 are deep amber in color and 2 are light pinkish. I would assume that means they are penetrating the bark membrane. I've seen a couple of beetles, they are black. Not sure if that helps. If applied both systemic and topical treatment can I save the tree? Does my tree have a good chance of survival? Again thanks for your expertise. If you read our pine borer article, you'll learn the holes you see are actually exit holes. These are left by adults which are leaving your infested tree to find a suitable location nearby to hang out, fine a mate and reproduce. Typically this will be a tree of the same species but it could be another type. The bottom line is if you have similar trees in the yard, I suggest you get them treated right away. First, spray any tree you want to protect from getting infested by using cypermethrin. Its highly repellent to these beetles and if you treat surrounding trees before they get the problem, the beetles will stay off them and away. Hopefully the treatment will cause them to move off your land altogether. Next, for the tree with activity, spray PT-Cykick into all exit holes. This will insure egg laying adults don't try to reuse these entry ports. Next, soil drench and topically spray the infested tree with Dominion. This will get to work on the current activity; the Cykick and Cypermethrin will preserve the tree and any others you treat. Follow these recommendations and you should be able to save your tree. I've seen trees with 50-100 holes survive so you should have some time left to get it healthy. Works well. I used the product yesterday and it is taking care of the problem. I still have some areas left to spray. hi, I need to use this on a bunch of potted plants, like 2inch and 4 inch pots. a whole greenhouse full of them. should I stick to your .3-.6 oz per gallon? I'm using it for whiteflies. Use the same rate. Regardless of the pot size, the rate of the product being applied needs to be in a certain range for it to work. In this case, you only need to saturate the soil to get it properly treated so it shouldn't take much material. And you should let it sit a few hours so the product effectively "dries" in the dirt which ensures it will remain active for many months. I've seen plants in greenhouses that get fed a continuous feed of water because their pots are so small and if your's does this, it will effectively prevent the Dominion from locking into the dirt. Other than that variable, using the same rate as one would use outside should yield excellent results inside and maybe even longer. Hi: I have an old (60 years or so) olive tree, which is infested with termites. The bark is beginning to peel away exposing a "trail" to the upper branches. I'm wondering if spraying the lower trunk is enough?? Common sense is telling me that I should also spray the exposed "trails" and/or the upper branches?? How careful do I need to be to avoid spraying the leaves of the tree?? This product is safe for living trees – right?? I have placed a number of "stakes" with termite killing bait in the ground around the tree, but I don't know how effective these stakes are. Thanks for your reply…..much appreciated!! PS: I have already cut off the branches that showed obvious signs of distress. If you review the label of this product (link above) you'll learn that in fact its labeled for use directly on trees, shrubs, turf, etc. so you can use it safely as a surface spray and as a systemic. In this case, I recommend you do both. The systemic treatment will allow the product to be absorbed by the roots of the tree. In turn, the active will be distributed throughout the trees branches and foliage which will kill insects attempting to feed on it. The foliage spray will kill anything on the outside. So to get the maximum effect, spray the trunk heavy focusing on the termite tubes you see. Do not use a high pressure sprayer as it will damage the tubes. This will chase the termites away. Instead use a gentle spray to allow the product to soak in. 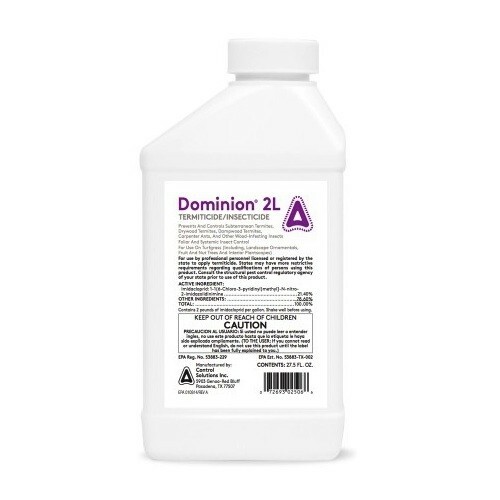 Dominion is "non repelling" which means it won't spook or chase the termites. Instead they'll continue to use it all the while getting exposed to the active which will lead to their demise. True, it will take a few days to work. But it will do the job. Lastly, the "termite stakes" you mentioned will only help if the termites find the offering and feed on them. In most cases, once termites are fixated elsewhere like on a home or tree, they rarely go for anything else until they exhaust their original food supply. Thank you very much. If I manually spray the trunk and branches of the tree, should I use the same solution as when I do the soil drenching of the tree ( .1 – .2 oz per inch of tree diameter)???? As stated above, mix .3-.6 oz per gallon of water for plant foliage. For soil drenching, .1-.2 oz per inch of tree width. So if the tree is 10 inches wide, 1-2 oz in 3-4 gallons of water would be sufficient. Item has not been used but appears to be as advertised, fast shipping!